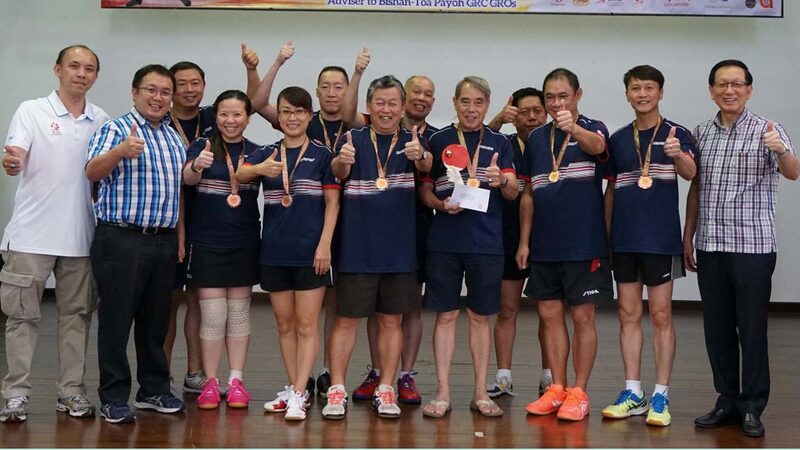 Promoting health through sport for those of more senior years organised by the Singapore Table Tennis Association in conjunction with the Toa Payoh East-Novena Community Club a team tournament for veterans was held on Saturday 10th and Sunday 11th June. A total of 15 teams participated, the oldest participant being 81 year old, Mok Wing Cheong. Overall play took place in three age group categories; the competition being innovative and rather different from the norm. Results achieved contributed to the overall team effort. Three Men’s Doubles events were held, combined ages determining eligibility; thus there was one competition where the total ages added to 90 years or more, another for 100 years or more and a third where the figure was 110 years or greater. Additionally in the 90 years or more and in the 100 years or more categories, there were Mixed Doubles events. Club 1 emerged as the winners finishing ahead of Sunsports, Tampines West CSC and Toa Payoh East-Novena CSC. Quarter-finalists were SAFRA, Chinese Swimming Club, Pan Royal and Nanyang CSC.